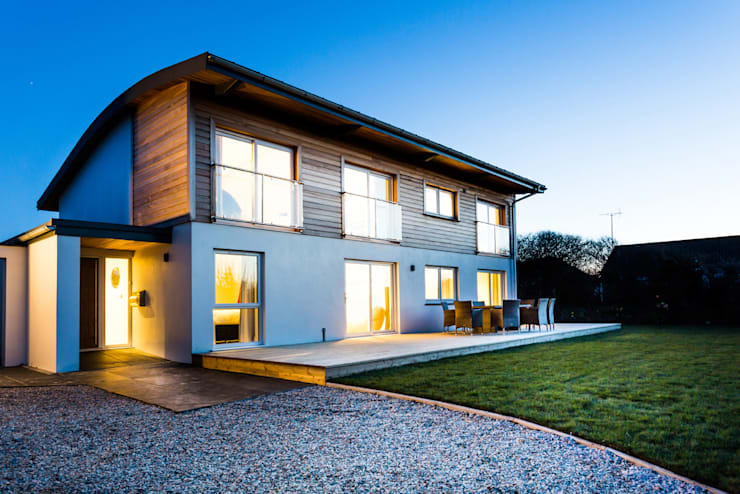 Designed by The Bazeley Partnership, architects based in Bude, Sundown is what contemporary homes are all about. 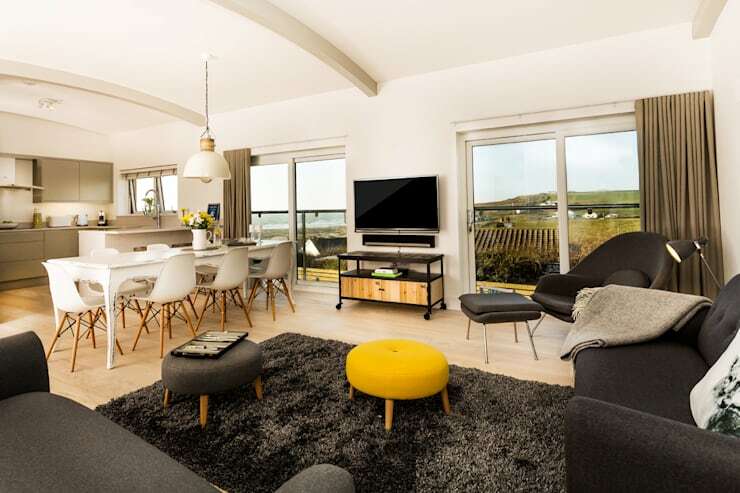 Positioned in Widemouth Bay, Cornwall, the architects were asked to replace a bungalow that was falling apart with something modern and new. Sundown was thus born. The Bazeley Partnership have explained, It was important to ensure the new home fit the height to satisfy planning criteria, and fit the original footprint. The result is a beautiful, modern home that is situated perfectly on the property, utilising the incredible views and the landscape around it. Widemouth is a bay with a beach, situated just off of the Atlantic coast in Cornwall, the UK. Sundown is thus based in an area similar to cities in South Africa that are situated in bays or on the coast, such as Cape Town, Durban, Port Elizabeth and East London. Sundown's classic style and design incorporating the views would suit any of these gorgeous cities. Follow us as we explore. The two-storey house is a wonderful example of contemporary design. A curved roof has been used by the architects, where they explain, This more innovative approach allows for first floor living accommodation with enhanced views. They add, Sundown's design has a strong contemporary appearance and adopts a form and materials that relate strongly to its coastal location. The materials used include timber cladding, a hardwood front door, aluminium windows and white render. 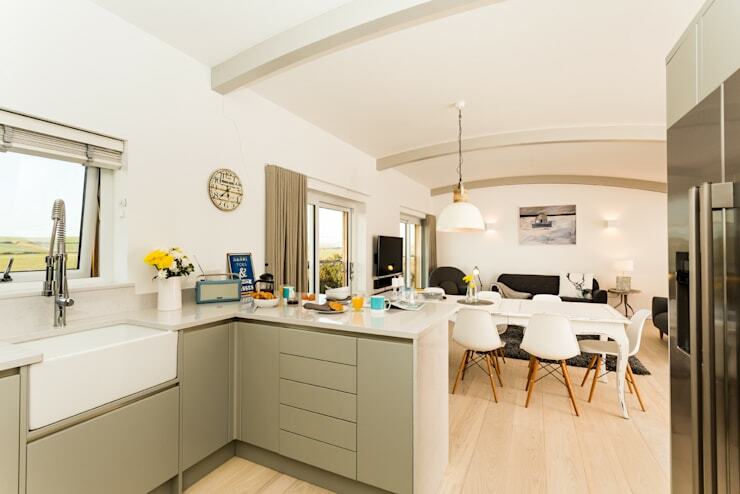 These all work together to create the look and feel of a beach house, however with its size and double-storey dimensions, beach living is taken to the next level. A large terrace spills out of the front of the house, where simple outside furniture allow for evening meals in the quiet hum of the surrounds. The terrace transitions into beautiful, sweeping lawns that complement the earthy tones of the exterior of the house. The exterior shows how comfort, design and relaxation all work together to create an overall modern, contemporary effect. The open plan living room, dining room and kitchen all look out onto the most spectacular views, including rolling fields and the ocean. The architects have thought very carefully about this, ensuring that the house faces these beautiful views. Large doors and windows open the interior of the house onto the exterior, used strategically every few metres throughout the open plan space. The interior design is modern and funky, working off of a gorgeous natural platform of wooden floors and white walls. A grey rug works with the cushy grey sofas, which are offset by a bright yellow ottoman. A sleek television rests against the wall before we come to a stylish dining area. The designers have paired the dining room table with white chairs, adding to clean, modern look. This area transitions into a sleek and stylish kitchen. This kitchen is designed to spill over into the living room and dining area, maintaining a family-orientated theme throughout this home. A little breakfast nook allows for breakfast and a cup of tea to be shared or homework to be done in the afternoons, while Mom or Dad is cooking. If guests are at the dining room table, the chef can fry up a gourmet dinner without breaking conversation. This modern open plan kitchen is the type of kitchen that is used more and more in modern architecture as the trend moves away from kitchens that are blocked off from the rest of the house. This type of kitchen allows for a much more social and interactive family space. The designers have stuck to a light grey and white in the kitchen. The grey offsets the stark white, making the area a bit softer and more natural in colour. This colour scheme works with the colours throughout the rest of the living areas. On the left of the living room area, the architects and designers have utilised a tiny nook by converting it into a little office area. This type of feature in a house shows how designers are trying to make use of every bit of space, contributing to more sustainable, eco-friendly and space-conscious homes. The yellow ottoman used in the living room is complemented by the yellow rug and lampshade used in this area. A simple black chair and wooden desk make up the rest of the area. Yellow is said to stimulate the mind as well as the nervous system. It also activates the memory. 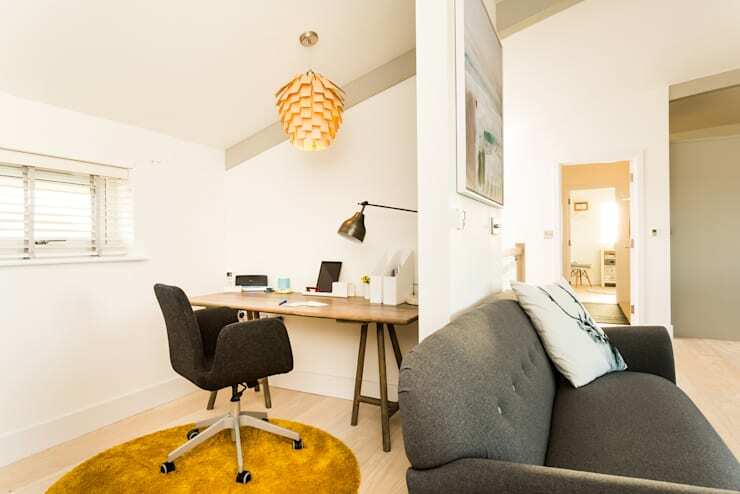 If you like the idea of using up wasted space for something as innovative as a little home office, read these tips on: Inventive Ways To Use That Wasted Space Under Your Stairs. This house wouldn't be a family home without a more casual and creative living room area. 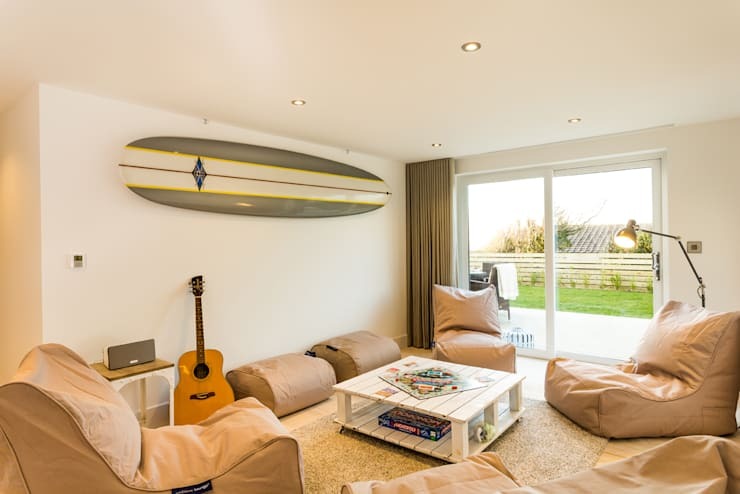 A surfboard and a guitar are design elements that at first glance give the impression of a more casual space. A guitar inspires an ambiance of sing-alongs around the fire while the surfboard shows that this a home full of surfers and beach-goers. The designers have stuck to very neutral-looking furniture, creating a very earthy look and feel. This further enhances the guitar and surfboard elements. The room also includes a large door that opens out onto the terrace. The house overlooks the beach as well as other incredible views, which is meant to be experienced from every room possible. The room also includes a variety of games, again adding to the family environment and relaxed ambiance of this space. The designers haven't compromised the modern, sleek style for comfort, however. A sound system rests in the corner of the room while each piece of furniture has been carefully thought out and is of high quality. 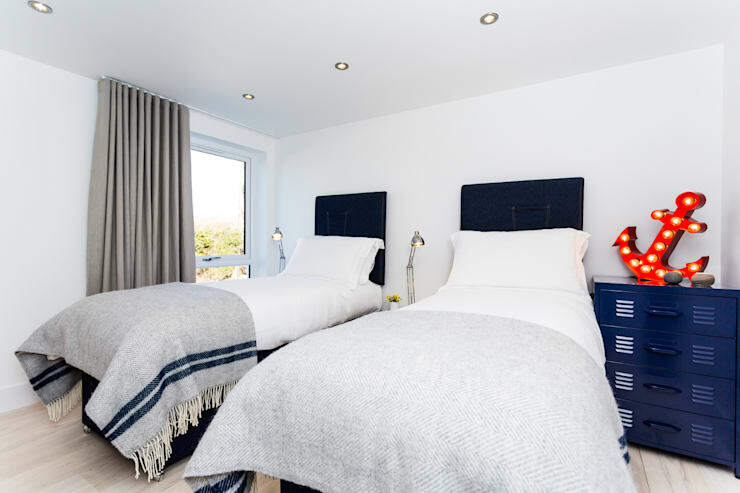 The bedrooms in Sundown add a bit of a nautical look and feel to the house, mirroring the coastal region that the house is situated in. Deep blues are used for the headboards in this room, while gorgeous grey and blue throws add colour to the cushy white bedspread. The views are designed to be seen even from the bedrooms of this home, where large windows open up the entire bedroom. This also allows natural light to filter into the bedroom, lighting it up with a soft glow. The designers have relied on this beautiful natural light, incorporating only a few lamps and a dimmer lights in the ceilings for artificial light. This is the epitome of modern and sustainable design. Despite splashes of colour, this room still remains simple in its use of clean white walls and linen. Quality is key here, where the designers have stuck to neutral with a few splashes of colour. Throughout the other bedrooms, this theme is mirrored. Sundown is the perfect home for a coastal city, allowing a relaxed ambiance to meet innovative modern architecture. Which was your favourite room? The beautiful living room? The cool chill out space? Let us know!